Arthur Rubinstein, during a visit to the Curtis Institute of Music in 1938, singled out just one young artist who was likely to achieve a major career, the twenty-four-year-old Cuban pianist Jorge Bolet, who already (like Rubinstein) had an inimitably beautiful piano tone. The confirmation of Rubinstein's prediction, however, was to be many decades in coming. Bolet (arguably similar to Rubinstein) had a narrative power and visceral excitement when playing before an audience that he seldom achieved in the recording studio. To celebrate Bolet's centennial, Marston presents this six-CD collection of concert performances, many of which are all new to the Bolet discography. Jorge Bolet was not the only pianist to have been called "the last romantic," but he was the only one to have worn the appellation "an old-fashioned Romantic pianist" as a proud badge of honor. He frequently invoked the memories of the pantheon of pianists who were his inspiration-Hofmann, Rachmaninoff, Friedman, Rosenthal, Moiseiwitsch, Cortot, Gieseking, and Paderewski. He said simply, "I wanted to be one of them." Here is a collection to prove he achieved just that. 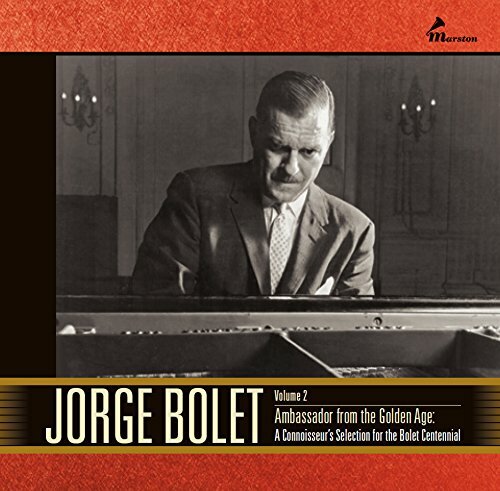 Although more than seven hours of Bolet playing, the recordings contained on this set are carefully-selected to highlight Jorge Bolet at his spontaneous best. Included are a number of Godowsky compositions that Jorge never recorded commercially; two selections from the 1970 International Piano Library benefit concert; and several pieces that are unique to the Bolet discography such as the Bach Toccata, the Mozart Rondo, the Chasins Schwanda Fantasy, and the Vořišek Impromptu in E.
If you have any questions about this product by Marston Records, contact us by completing and submitting the form below. If you are looking for a specif part number, please include it with your message.